A government task force is preparing legislation that would pressure companies such as Face­book and Google to enable law enforcement officials to intercept online communications as they occur, according to current and former U.S. officials familiar with the effort. Rather than antagonizing companies whose cooperation they need, federal officials typically back off when a company is resistant, industry and former officials said. But law enforcement officials say the cloak drawn on suspects’ online activities — what the FBI calls the “going dark” problem — means that critical evidence can be missed. Push to Require Online Sales Tax Divides the G.O.P. Legislation that would force Internet retailers to collect sales taxes from their customers has put antitax and small-government activists like Grover Norquist’s Americans for Tax Reform and the Heritage Foundation in an unusual position: they’re losing. For years, conservative Republican lawmakers have been influenced heavily by the antitax activists in Washington, who have dictated outcomes and become the arbiters of what is and is not a tax increase. But on the question of Internet taxation, their voices have begun to be drowned out by the pleas of struggling retailers back home who complain that their online competitors enjoy an unfair price advantage [and Sid adds, local governments and school districts who lose sales taxes from online purchasaes]. The Marketplace Fairness Act would allow state governments to force Internet retailers to collect sales taxes from their customers and remit the proceeds to state and local governments, just as brick-and-mortar retailers have done for decades. The states would be required to provide free software that would be embedded in retail Web sites to do the calculations. Mr. Norquist, whose organization maintains the antitax pledge that virtually every Republican in Washington has signed, calls it the “Let People in Alabama Loot People in New York Act.” To him, the bill is a money grab by cash-poor state and local governments that would get the power to tax consumers who do not have the power to vote them out of office. Supporters of the bill . . . argue that the bill, which could generate as much as $24 billion in new tax revenues, is not a tax increase at all. It only ensures that taxes already owed are actually paid. Most states collect 4 to 7 percent on retail purchases. For Senator Roy Blunt of Missouri, it is a bridal shop in St. Louis where customers try on dresses, check the labels for the product code, and then order the same product online, free of sales tax. For Representative Austin Scott, an ardent conservative Republican from Georgia, it’s Ken’s Trading Company, where the profit margin on a Leupold rifle scope is lower than the sales tax too many Georgians are avoiding by shopping for the same scope on their computers. For opponents of the bill, the impotence of the antitax arguments has been a revelation. Mr. Norquist and other conservatives are not mincing words. Heritage Action predicted that the Internet bill would usher in “tax audits from hell” for online retailers who could be subject to scrutiny from taxing authorities all over the country at year’s end. Mr. Blunt grimaced at such assertions and recalled an interview he did with a television reporter in St. Louis. After the cameras were turned off, the reporter told him of his wife’s friend and her bridal store — which for many customers has turned into a showroom to try out the wares before buying them online. “They use the parking lot. They use the sidewalk. They benefit from police protection, and then the local merchant who pays for all of that doesn’t get the sale,” he said, suggesting that the groups’ angry opposition in Washington could prove to be something of a watershed with Republicans. Americans are leaving the labor force in unprecedented numbers. But the trend has more to do with retiring baby boomers than frustrated job seekers abandoning their searches. The share of the population either working or looking for work in March hit its lowest level since 1979. The measure, known as the participation rate, now stands at 63.6%, down from 66% when the recession began. That represents close to seven million workers who are now "missing" from the labor force. The April jobs report, coming Friday, probably won't repeat March's historic decline, when the labor force shrank by nearly half a million workers. But it likely won't show much improvement, either. The participation rate has trended downward through both the recession and the recovery, continuing to fall even as other measures of economic well-being have improved. The falling participation rate raises two main fears among economists. First, it could suggest that the labor market is even weaker than it appears. The unemployment rate, for example, fell to 7.6% in March, its lowest level since late 2008. But that figure only includes people who are actively looking for work. Add back the missing millions and the unemployment rate would be 11.4%. The second fear is that if unemployed workers are giving up on finding jobs, they could drift so far from the labor market that they will be unlikely to return even when hiring picks up. They will go on disability insurance—8.9 million Americans were receiving federal disability payments in March, up from 7.1 million when the recession began—or other government benefits, retire earlier than planned, or work for cash in the gray economy. That could create deeper structural problems that could persist long after the rest of the economy heals. A close look at the numbers suggests both fears, though real, may be exaggerated. “The 19-year-old suspect in the Boston Marathon bombings has told interrogators that the American wars in Iraq and Afghanistan motivated him and his brother to carry out the attack, according to U.S. officials familiar with the interviews . . . ."
This is a popular meme among radical Muslim groups, and, to be sure, some Muslim youths were deeply angered by the U.S. interventions in the Middle East. The brothers Tsarnaev may have been among them. But what in God’s name does that have to do with planting a bomb at the Boston Marathon and blowing up innocent people? It is amazing to me how we’ve come to accept this non sequitur and how easily we’ve allowed radical Muslim groups and their apologists to get away with it. Moreover, some 70,000 people, most of them Muslims, have been killed by other Muslims in the Syrian civil war, which the U.S. had nothing to do with — although many Muslims are now begging us to intervene to stop it. And every week innocent Muslims are blown up by Muslim suicide bombers in Pakistan and Iraq — every week. Thousands of them have been maimed and killed in attacks so nihilistic that the bombers don’t even bother to give their names or make demands. Yet this does not appear to have moved the brothers Tsarnaev one iota. But we must ask a question only Muslims can answer: What is going on in your community that a critical number of your youth believes that every American military action in the Middle East is intolerable and justifies a violent response, and everything Muslim extremists do to other Muslims is ignorable and calls for mostly silence? Syrian officials recognize that the United States is worried that it has few natural allies in the armed opposition and have tried to exploit that with a public campaign to convince, or frighten, Washington into staying out of the fight. At every turn they promote the notion that the alternative to Mr. Assad is an extremist Islamic state. The religious agenda of the combatants sets them apart from many civilian activists, protesters and aid workers who had hoped the uprising would create a civil, democratic Syria. President Obama said Friday that he would respond “prudently” and “deliberately” to evidence that Syria had used chemical weapons, tamping down any expectations that he would take swift action after an American intelligence assessment that the Syrian government had used the chemical agent sarin on a small scale in the nation’s civil war. Analysts who closely follow the fortunes of Amazon say collecting taxes is unlikely to drive away its customers. They say it may even help the Seattle company while simultaneously defusing a potent political issue. In the few states where the company has already begun collecting, said Gene Munster, an analyst with Piper Jaffray, sales dip for about a year. “Then the customers come back for the convenience and selection,” he said. Figuring out the tax in thousands of jurisdictions could be a logistical nightmare for merchants just above the legislation’s threshold of $1 million in annual revenue. That is another place where Amazon is expected to benefit; it could sell tax collection services to tens of thousands of third parties. For some store owners, the digital world’s momentum can seem overpowering. Ms. Demetropoulos tried to sell specialty toys online, but business dwindled as Amazon sought out her competitors and signed them up to sell through its Web site. The company courted her as well. “I’m like, ‘Are you kidding?’ ” she said. Customers come into one of the branches of Island Treasure Toys, she said, scan a toy on their smartphone, and inform the sales clerk that Amazon sells it cheaper. Would the store be willing to make a deal? The tax will not help this situation much, which is regularly played out in all kinds of stores across the country. If retailers say no, Amazon often gets the business. Under the current system, an Internet company has to collect taxes only in states where it has a physical location. For most companies, that means the state in which it has its headquarters. In recent years, states struggling in the recession became more aggressive toward Amazon. Texas, New York and California all pursued the company over the tax issue. Amazon began making deals to collect the tax while simultaneously building warehouses that would bring it closer to its customers, bringing same-day delivery within reach. The bill, called the Marketplace Fairness Act, would allow states to require online sellers around the country to collect sales tax for them on purchases made by their residents. Big online sellers have expanded their physical operations nationwide, building warehouses and other facilities to speed delivery, while traditional stores increasingly have an online presence. That has turned the tables for the online retailers, which had benefitted richly from not having to charge shoppers a sales tax on their goods in most states. With their advantage eroding, the Web stores have become part of a surge of corporate support helping to propel the Senate bill toward likely passage, at least in that chamber and possibly also in the House. The legislation would effectively replace a 1992 Supreme Court decision, made in the early days of the commercial Internet, that held that a state couldn't force a retailer to collect sales tax unless the retailer had a physical presence in the state, such as a store or a warehouse. The bill highlights the maturation of e-commerce into an increasing threat to established retailers like Wal-Mart. While more than 90% of retail is still in bricks-and-mortar storefronts, e-commerce retailers promise nearly unlimited inventory, fast delivery to customers' doors and lower prices. Amazon Chief Executive Jeff Bezos has said he founded his company in low-population Washington state so sales taxes wouldn't affect customers in bigger states. And for years, Amazon gave employees color-coded U.S. maps that showed "red states" where they couldn't travel for fear of triggering sales-tax collection. But as Amazon has grown, the red states have dwindled. With an eye on ever-faster shipping, Amazon has been striking deals with states to build massive distribution centers close to urban centers in exchange for delaying the start of sales-tax collection or other advantages. In 2012 alone, some of the largest states, including California, Texas and Pennsylvania, began requiring sales-tax collection from Amazon customers. And by 2014, Connecticut, Massachusetts and several other states will require the levies. Immigration Law in America - Review legislative milestones and key shifts in immigration policy. Over five million immigrants arrive during the 1880s. Congress enacts the Immigration Act of 1882, banning arriving passengers deemed as 'convicts, lunatics, idiots' or otherwise unable to care for themselves and establishing a 50-cent tax per foreign passenger, for ship owners. The same year, Congress suspends immigration of Chinese nationals for 10 years, through the Chinese Exclusion Act. President Benjamin Harrison signs a law that makes it a federal misdemeanor to bring into the U.S. any non-citizen not lawfully entitled to enter. The Ellis Island immigration reception center opens. Congress extends the 1882 ban on Chinese immigrants for 10 more years and requires all Chinese nationals in the U.S. to obtain certificates to prove their presence in the country is legal. The ban is made permanent in 1902. The Chinese Exclusion Act is repealed in 1943. The Immigration Act of 1917 prohibits immigration from the 'Asiatic barred zone' (British India, most of Southeast Asia, and almost all of the Middle East), with an exemption for students, certain professionals and their families. It also expands the list of reasons immigrants could be barred, placing anarchists and persons previously deported, among others, on the list. As postwar immigration rebounds, a number of bills are introduced to restrict the number of immigrants. The Emergency Quota Law limits the number of people allowed to enter each year to 3% of the number of foreign-born people of each nationality living in the U.S. as of the 1910 census. The quota doesn’t apply to temporary visitors, government officials, and citizens of Western Hemisphere countries. The National Origins Quota Act further restricts immigration, changing the national quotas to 2% of each country's U.S. population in the 1890 census. 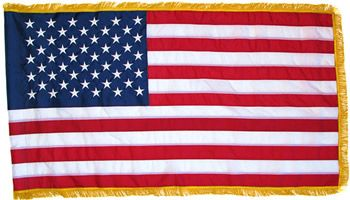 Exempt are students, nationals of Western Hemisphere countries, members of certain professions, and the wives and children of U.S. citizens. Prompted by World War II labor shortages, the U.S. and Mexico sign the Bracero agreement, allowing the entry of temporary agricultural workers from Mexico. The program continues in some form until 1964. More than 200,000 people displaced by the former Nazi regime are allowed into the U.S. under the Displaced Persons Act. The Immigration and Nationality Act consolidates several immigration laws into one statute, preserving the quotas but allowing Asian nationals to immigrate for the first time. The Refugee Relief Act allows as many as 205,000 non-quota immigrants to enter as refugees from war-torn Europe. President John F. Kennedy signs the Migration and Refugee Assistance Act, which is aimed at helping Cubans fleeing Communism. The Immigration and Nationality Act abolishes the quota system and replaces it with an admissions process based on relationships with U.S. citizens or employers. The Refugee Act defines a 'refugee' as any person unable or unwilling to return to his or her own country because of persecution or fear of persecution on account of personal opinions, race, religion, nationality or membership in a particular social group. President Ronald Reagan persuades Congress to pass the Immigration Reform and Control Act. The law imposes sanctions on employers that knowingly recruit or hire unauthorized immigrants and creates two legalization programs, one for illegal immigrants in the country before 1982 and the other for certain temporary agricultural workers. Eventually, under these programs, 2.7 million people would become lawful permanent residents. President Bush signs into law the Immigration Act of 1990, which increases the limits on legal immigration, eases controls on temporary workers and limits the government’s power to deport immigrants for ideological reasons. The Illegal Immigration Reform and Immigrant Responsibility Act outlines new reasons for which hopeful immigrants can be determined inadmissible or deportable, expands the list of crimes constituting an aggravated felony, creates expedited removal procedures, and gives judges less leeway in their review of immigration decisions. The Patriot Act, passed as a response to the 9/11 attacks, broadens the terrorism grounds for blocking would-be immigrants and increases monitoring of foreign students studying in the U.S.
Congress mandates the installation of an electronic data system that can share information from federal law-enforcement and intelligence agencies on would-be immigrants, plus an integrated entry-exit data system. It also creates the Department of Homeland Security, which becomes responsible for immigration services, border enforcement and border inspection. The REAL ID Act establishes guidelines for removal cases, again expands the terrorism-related grounds for inadmissibility and deportation, adds measures to improve border infrastructure, and requires states to verify that driver’s license and ID applicants are legal U.S. residents. The Senate fails to pass immigration legislation that had passed the House in 2005. Instead, Congress enacts the Secure Fence Act, calling for 700 miles of double-reinforced fence to be built along the border with Mexico. President Barack Obama announces the Deferred Action for Childhood Arrivals program, which could allow nearly two million young illegal immigrants to remain in the country and work legally. In the winter of 2010, after a decade of defending the government against bias claims by Hispanic and female farmers, Justice Department lawyers seemed to have victory within their grasp. Ever since the Clinton administration agreed in 1999 to make $50,000 payments to thousands of black farmers, the Hispanics and women had been clamoring in courtrooms and in Congress for the same deal. They argued, as the African-Americans had, that biased federal loan officers had systematically thwarted their attempts to borrow money to farm. But a succession of courts — and finally the Supreme Court — had rebuffed their pleas. Instead of an army of potential claimants, the government faced just 91 plaintiffs. Those cases, the government lawyers figured, could be dispatched at limited cost. On the heels of the Supreme Court’s ruling, interviews and records show, the Obama administration’s political appointees at the Justice and Agriculture Departments engineered a stunning turnabout: they committed $1.33 billion to compensate not just the 91 plaintiffs but thousands of Hispanic and female farmers who had never claimed bias in court. The deal, several current and former government officials said, was fashioned in White House meetings despite the vehement objections — until now undisclosed — of career lawyers and agency officials who had argued that there was no credible evidence of widespread discrimination. What is more, some protested, the template for the deal — the $50,000 payouts to black farmers — had proved a magnet for fraud. The compensation effort sprang from a desire to redress what the government and a federal judge agreed was a painful legacy of bias against African-Americans by the Agriculture Department. But an examination by The New York Times shows that it became a runaway train, driven by racial politics, pressure from influential members of Congress and law firms that stand to gain more than $130 million in fees. In the past five years, it has grown to encompass a second group of African-Americans as well as Hispanic, female and Native American farmers. In all, more than 90,000 people have filed claims. The total cost could top $4.4 billion. From the start, the claims process prompted allegations of widespread fraud and criticism that its very design encouraged people to lie: because relatively few records remained to verify accusations, claimants were not required to present documentary evidence that they had been unfairly treated or had even tried to farm. Agriculture Department reviewers found reams of suspicious claims, from nursery-school-age children and pockets of urban dwellers, sometimes in the same handwriting with nearly identical accounts of discrimination. Yet those concerns were played down as the compensation effort grew. Though the government has started requiring more evidence to support some claims, even now people who say they were unfairly denied loans can collect up to $50,000 with little documentation. As a senator, Barack Obama supported expanding compensation for black farmers, and then as president he pressed for $1.15 billion to pay those new claims. Other groups quickly escalated their demands for similar treatment. In a letter to the White House in September 2009, Senator Robert Menendez of New Jersey, a leading Hispanic Democrat, threatened to mount a campaign “outside the Beltway” if Hispanic farmers were not compensated. The groups found a champion in the new agriculture secretary, Tom Vilsack. New settlements would provide “a way to neutralize the argument that the government favors black farmers over Hispanic, Native American or women farmers,” an internal department memorandum stated in March 2010. The payouts pitted Mr. Vilsack and other political appointees against career lawyers and agency officials, who argued that the legal risks did not justify the costs. Also see article at The Wall Street Journal entitled "Suspects' Mother Was Placed on Watch List" was is noted as sayiny: "We never should have come to America," she said. "We tried, but I wouldn't do it again." Syria Campaigns to Persuade U.S. to Change Sides - Syria's Shifting Strategy: As Syria’s civil war continues, Bashar al-Assad’s government is trying to convince Western countries that they should not support rebel forces because many are extremists allied with Al Qaeda. As Islamists increasingly fill the ranks of Syrian rebels, President Bashar al-Assad is waging an energized campaign to persuade the United States that it is on the wrong side of the civil war. Some government supporters and officials believe they are already coaxing — or at least frightening — the West into holding back stronger support for the opposition. Confident they can sell their message, government officials have eased their reluctance to allow foreign reporters into Syria, paraded prisoners they described as extremist fighters and relied unofficially on a Syrian-American businessman to help tap into American fears of groups like Al Qaeda. Despite hopes in Damascus, President Obama has not backed off his demand that Mr. Assad step down. The administration has also kept up economic pressure on his government and has increased nonlethal aid to the opposition while calling for a negotiated settlement to the fighting. But the United States has signaled growing discomfort with the rising influence of radical Islamists on the battlefield, and it remains unwilling to arm the rebels or to consider stepping in more forcefully without conclusive evidence that the Syrian government used chemical weapons, as some Israeli officials assert. Opponents say the government itself has fueled sectarianism, first by favoring Mr. Assad’s Alawite sect, now by using code words like “Wahhabis” and “Al Qaeda” to blame the Sunni Muslim majority for the violence. Officials said that if Mr. Assad fell, Europe would face an arc of Islamist-led states from Turkey to Libya. The SNAP program in Florida: More people than ever rely on Supplemental Nutrition Assistance Program (SNAP), formerly known as food stamps. This is in part due to a bad economy, but it’s also because hundreds of recruiters now work to enroll people in the government program. [I]t is Nerios’s job to enroll at least 150 seniors for food stamps each month, a quota she usually exceeds. Alleviate hunger, lessen poverty: These are the primary goals of her work. But the job also has a second and more controversial purpose for cash-strapped Florida, where increasing food-stamp enrollment has become a means of economic growth, bringing almost $6 billion each year into the state. The money helps to sustain communities, grocery stores and food producers. It also adds to rising federal entitlement spending and the U.S. debt. To help enroll more seniors, the government has published an outreach guide that blends compassion with sales techniques, generating some protests in Congress. The guide teaches recruiters how to “overcome the word ‘no,’ ” suggesting answers for likely hesitations. With little fuss or political protest - or notice abroad - Denmark has been at work overhauling entitlements, trying to prod Danes into working more or longer or both. See this story in The New York Times. With the television in her pizzeria showing an endless loop of the Boston manhunt on Friday, Bessie Kontis glanced up at scenes of the quasi-military lockdown and shuddered. Ms. Kontis was born in Greece and immigrated to the United States as a child, but when two men of Chechen heritage were identified as the suspects in the fatal Boston Marathon bombings, her usually broad views about immigration became colored by concerns for national security. As a national debate over major immigration reform begins in Congress, some opponents are pointing to the Boston bombings as cause for concern about expanding visa programs and offering millions of illegal immigrants a path to citizenship. On Friday, Senator Charles E. Grassley, a senior Iowa Republican on the committee debating the plan, which is proposed by a bipartisan group of eight senators, said the terrorist bombings should figure into the debate. Some conservative commentators and Congressional Republicans want to shift the focus away from economic and humanitarian concerns to border security and the potential threat from terrorists entering the country. How successful their efforts turn out to be, and whether Boston slows momentum for change, could depend on how many citizens express views like Ms. Kontis’s. But judging by a sampling of voters in one politically divided region, the western suburbs of Philadelphia, the Boston bombings may be an imperfect test case for opponents of reform. In interviews Friday night, as the denouement of the manhunt played out in the hours when people gathered in taverns or strolled the streets on a pleasant evening, many mentioned that the two brothers linked to the attacks — Dzhokhar A. Tsarnaev, 19, who was captured Friday, and Tamerlan Tsarnaev, 26, who was killed earlier — had arrived in the country a decade earlier, with a father who claimed asylum because of the conflict in their homeland. They could hardly have been identified by more vigilant border control, people said. Like nearby Wayne, Malvern is part of a suburban belt that has grown more Democratic in recent elections. Attitudes toward immigration reform seem to be changing, in part along generational lines. Frank Cunningham, a 27-year-old accountant, said that he, unlike his father, favors a path to citizenship for the estimated 11 million illegal immigrants in the country. Gary Burnett, 35, said he favored a path to citizenship and expanded permanent-resident visas for those waiting outside the country, because the nation is already part of a global economy. He thought the potential that some immigrants might turn out to be terrorists was a red herring. Although information is still emerging about their exact connections to the Russian regions of Chechnya and Dagestan, early reporting suggests that Boston marathon bombing suspects Dzhokhar Tsarnaev and Tamerlan Tsarnaev may be of Chechen origin and may have grown up partially in neighboring Dagestan, The Washington Post reports. 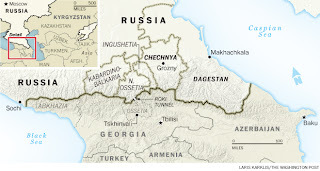 The regions are sometimes described as part of the "Caucasus region," so named for the Caucasus mountains. 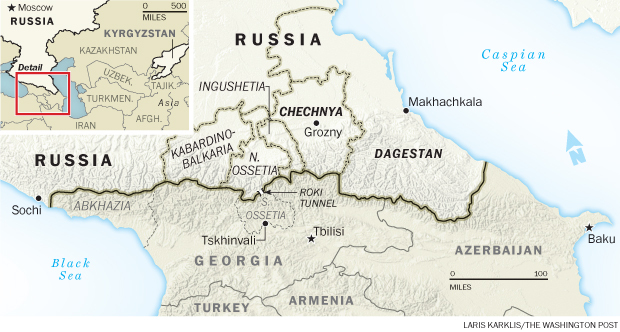 Three years ago, when Dzhokhar Tsarnaev was assigned by his high school English teacher to write an essay on something he felt passionate about, he chose the troubled land of his ancestors: Chechnya. He wrote to Brian Glyn Williams, a professor at the University of Massachusetts at Dartmouth. Mr. Tsarnaev was born in Dagestan and had never lived in neighboring Chechnya, relatives said, but it fascinated him. The professor sent him material covering Stalin’s 1944 deportation of the Chechens to Central Asia, in which an estimated 30 percent of them died, and the two brutal wars that Russia waged against Chechen separatists in the 1990s, which killed about 200,000 of the population of one million. As law enforcement and counterterrorism officials try to understand why Mr. Tsarnaev, 19, and his brother, Tamerlan, 26, would attack the Boston Marathon, they will have to consider a cryptic mix of national identity, ideology, religion and personality. Even President Obama, when he addressed the nation on Friday night after Dzhokhar Tsarnaev was captured, seemed to be searching for answers. “Why did young men who grew up and studied here, as part of our communities and our country, resort to such violence?” he said. It remains to be seen whether personal grievance or some type of ideology was behind the attack, in which investigators say the Tsarnaevs packed black powder into pressure cookers to kill and maim people. Both brothers were open about their devotion to Islam, and Tamerlan’s Web postings suggested an attraction to radicalism, but neither appears to have publicly embraced the ideology of violent jihad. The construction of the bombs in Boston resembled instructions in Inspire, the online magazine of the Al Qaeda branch in Yemen, but the design is available elsewhere online. Their relatives have expressed anguished bafflement, and it is conceivable that the motive for the attack will remain as inscrutable as those of some mass shootings in recent years. Still, as investigators try to understand the brothers’ thinking, search for ties to militant groups and draw lessons for preventing attacks, they will be thinking of some notable cases in which longtime American residents with no history of violence turned to terrorism: the plot to blow up the New York subway in 2009, the Fort Hood shootings the same year and the failed Times Square bombing of 2010, among others. “I think there’s often a sense of divided loyalties in these cases where Americans turn to violent jihad — are you American first or are you Muslim first? And also of proving yourself as a man of action,” said Brian Fishman, who studies terrorism at the New America Foundation in Washington. 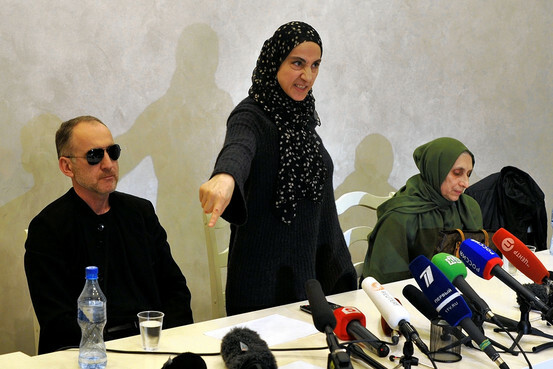 Mr. Fishman cautioned that it was too early to draw any firm conclusions about the Tsarnaev brothers, but said there were intriguing echoes of other cases in which young men caught between life in America and loyalty to fellow Muslims in a distant homeland turned to violence, partly as a way of settling the puzzle of their identity. Akbar Ahmed, the chairman of Islamic studies at American University in Washington, described such men: “They are American, but not quite American.” His new book, “The Thistle and the Drone: How America’s War on Terrorism Became a War on Tribal Islam,” examines how tribal codes of hospitality, courage and revenge have shaped the reaction to American counterterrorism strikes. Add feelings of guilt that they are enjoying a comfortable life in America while their putative brothers and sisters suffer in a distant land and an element of personal estrangement — say, Tamerlan Tsarnaev’s statement in an interview long before the attack that after five years in the United States, “I don’t have a single American friend” — and it is a combustible mix. After about a decade in the United States, the Tsarnaev brothers had both enrolled in college — the elder brother at Bunker Hill Community College, though he had dropped out; the younger at the University of Massachusetts at Dartmouth. Tamerlan was a Golden Gloves boxer and was married with a child; Dzhokhar had been a popular student at a Cambridge school and earned a scholarship for college. On the face of it, they were doing reasonably well. But the same might have been said, at least at certain stages in their lives, of those behind other recent attacks. Faisal Shahzad, who staged the failed Times Square bombing at age 30, had graduated from the University of Bridgeport in Connecticut, earned an M.B.A. and worked as a financial analyst. He married an American-born woman of Pakistani ancestry, and they had two children. But as he became steadily more focused on radical religion, he traveled to Pakistan and sought training as a terrorist. Just six months earlier, in November 2009, Maj. Nidal Malik Hasan, then 39, was accused of opening fire on a crowd of soldiers and civilians at Fort Hood, Tex., killing 13 people. Born in Virginia to Palestinian parents, he had graduated from medical school and become an Army psychiatrist. But he began to ponder what he felt was a conflict between his duty as an American soldier and his allegiance to Islam. Months before the shootings, investigators say, he consulted Anwar al-Awlaki, the radical Yemeni-American cleric who was later killed in an American drone strike, about whether killing his fellow soldiers to prevent them from fighting Muslims in Afghanistan would be justified. Even Najibullah Zazi, the Afghan-American who plotted to attack the New York subway with backpacks loaded with explosives, spent five years as a popular coffee vendor in Manhattan’s financial district, with a “God Bless America” sign on his cart. He was 24 at the time of his arrest. In the history of Islamic radicalism, there are far more prominent figures who spent time in the United States. The Egyptian Sayyid Qutb, who would become the most influential philosopher of jihad against the West, visited on an educational exchange program from 1948 to 1950, developing a deep-seated revulsion for what he saw as American materialism and immorality. In the 1980s, Khalid Shaikh Mohammed, who went on to plan the Sept. 11 attacks, spent four years studying in North Carolina, earning an engineering degree. His American sojourn did not stop him from devoting the next two decades to plotting against Western and American targets. If the grim Chechen history that Mr. Williams, the University of Massachusetts professor, shared with Dzhokhar Tsarnaev turns out to be part of the motivation behind the attack, one might have expected the anger to have been directed at Russians, not Americans. But in the mid-1990s, Mr. Williams said, the Chechen separatist movement split between those who focused locally on the struggle for independence and others who saw their fight as part of a global jihad. In the propaganda pioneered by Al Qaeda, terrorism is merely self-defense against a perceived American war on Islam. There has been no more stark statement of this belief than the courtroom declarations of Mr. Shahzad as he pleaded guilty and was sentenced to life without parole for the failed bombing in Times Square. This much seems to me to be a given: The Boston bombing not only injects a new issue into that debate but also potentially robs the president and lawmakers of some of the momentum to overhaul the nation’s immigration laws. Article in The New York Times discussing how members of a bipartisan group urge caution after a senior senator says the approaching debate on immigration overhaul should take into account the revelation that the Boston bombing suspects apparently immigrated to the United States. Let’s face it, the gun issue has its own unique dynamic, which is that the people who oppose gun limits vote on this issue while the people who support them do not. Liberals are furious, but the gun issue will not significantly damage the Republican Party. Sure, it looks bad to oppose background checks, which have overwhelming popular support. Sure, the Republican position will further taint the party’s image in places like the suburbs of Philadelphia and Northern Virginia. Sure, the party looks extreme when it can’t accept a bill sponsored by the conservative Senator Joe Manchin and the very conservative Senator Pat Toomey. But, let’s face it, the gun issue has its own unique dynamic, which is that the people who oppose gun limits vote on this issue while the people who support them do not. Moreover, Democrats never made a compelling case that the bill would have been effective, that it would have directly prevented future Sandy Hooks or lowered the murder rate nationwide. Even many of the bill’s supporters were lukewarm about its contents. The main reason the gun issue won’t significantly harm Republicans is that it doesn’t play into the core debate that will shape the future of the party. The issue that does that is immigration. The near-term future of American politics will be determined by who wins the immigration debate. In the months since the election, a rift has opened between the Republicans you might call first-wave revolutionaries and those you might call second-wave revolutionaries. The first-wave revolutionaries (the party’s Congressional leaders) think of themselves as very conservative. They ejected the remaining moderates from their ranks. They sympathize with the Tea Party. They are loyal to Fox News and support a radical restructuring of the government. These first-wave revolutionaries haven’t softened their conservatism, but they are trying to adjust it to win majority support. They are trying to find policies to boost social mobility, so Republicans look less like the party of the rich. They are swinging behind immigration reform, believing that Hispanics won’t even listen to Republicans until they put that issue in the rearview mirror. The second-wave revolutionaries — like Rand Paul (on some issues), Jim DeMint, Ted Cruz and some of the cutting-edge talk radio jocks — see the first-wave revolutionaries as a bunch of incompetent establishmentarians. They speak of the Bush-Cheney administration as if it were some sort of liberal Republican regime run by Nelson Rockefeller and Jacob Javits. They argue that Republicans have lost elections recently because the party has been led by big-spending, mushy moderates like John McCain and Mitt Romney and managed by out-of-touch elitists like Karl Rove and Reince Priebus. The second wavers are much more tactically aggressive, favoring filibusters and such when possible. What the party needs now, they argue, is an ultra-Goldwaterite insurgency that topples the “establishment,” ditches immigration reform and wins Hispanic votes by appealing to the evangelicals among them and offering them economic liberty. The first and second wavers are just beginning their immigration clash. A few weeks ago, I would have thought the pro-immigration forces had gigantic advantages, but now it is hard to be sure. The immigration fight will be pitting a cohesive insurgent opposition force against a fragile coalition of bipartisan proponents who have to ambivalently defend a sprawling piece of compromise legislation. We’ve seen this kind of fight before. Things usually don’t end up well for the proponents. Whether it’s guns or immigration, it is easy to imagine that the underlying political landscape, which prevented progress in the past, has changed. But when you actually try to pass something, you often discover the underlying landscape has not changed. The immigration fight of 2013 might bear an eerie similarity to the fight of 2007. The arguments that might persuade Republicans to support immigration reform are all on the table. They came on election night 2012. The arguments against are only just now unfolding. It is just a fact that the big short-term beneficiaries of this law are not generally Republicans: the 11 million who are living in the shadows; the high-tech entrepreneurs who will get more skilled labor. The short-term losers, meanwhile, are often Republicans: the white working-class people who will face a new group of labor-market competition when they try to get jobs in retail; the taxpayers who, at least in the short term, will have to pay some additional costs. In the past, Republican politicians have had trouble saying no to the latest and most radical insurgency. Even if they know immigration reform is eventually good for their party, lawmakers may figure that opposing it is immediately necessary for themselves. It would be great if Republicans can hash out their differences over a concrete policy matter, especially immigration, which touches conservatism’s competing values. But if the insurgent right defeats immigration reform, that will be a sign that the party’s self-marginalization will continue. The revolution devours its own. Merely by glancing around, it’s clear that tattoos are no longer the sole province of gang members, garage mechanics, guys who are admirably confident that they will have the same girlfriend forever and Hollywood outliers like Angelina Jolie and Lena Dunham. Twenty-three percent of Americans have a tattoo, according to a Pew Research poll from 2010; 32 percent of those are aged 30 to 45. Sixty-one percent of human-resource managers asked last year in an annual survey by the Center for Professional Excellence at York College of Pennsylvania said a tattoo would hurt a job applicant’s chances, up from 57 percent in 2011. 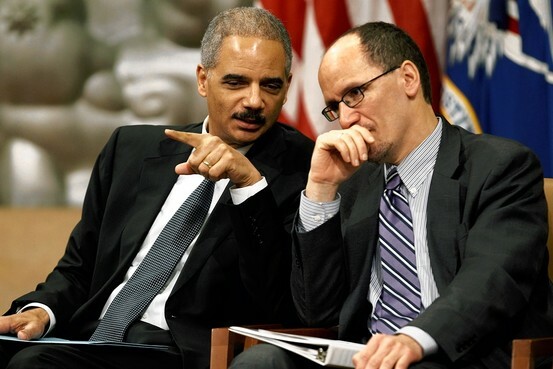 Thomas Perez rose to prominence as a strong advocate of civil and workers' rights, a record that led to a nomination as U.S. Labor Secretary. As he faces a confirmation hearing Thursday, that same record is likely to make the process contentious. Republicans worry that Mr. Perez will prove an aggressive regulator, a notion to which his tenure as head of the Justice Department Civil Rights Division lends some support. Under his leadership, the division has begun a record number of investigations of local police departments, and last year it filed more briefs in voting-rights cases than were filed in the previous nine years combined. Mr. Perez last year sued Joe Arpaio, the Arizona sheriff who drew attention for his crackdowns on suspected illegal immigrants, accusing his office of discrimination. And in a move that has ignited controversy, Mr. Perez worked out a deal with St. Paul, Minn., under which the city withdrew a Supreme Court appeal that posed a threat to a rights-enforcement tool the U.S. uses. Mr. Perez's record as a Maryland state official suggests he would push policies that rankle many employers, such as stricter enforcement of a variety of workplace regulations. If confirmed, he could have a hand in shaping enforcement of any immigration overhaul Congress enacts. Depending on what passes, the Labor Department might find itself writing rules for bringing lower-skilled temporary workers into the U.S. or for electronic verification of immigrants' legal status. Documents reviewed by The Wall Street Journal show Mr. Perez worked to obtain a deal in which the city dropped its appeal of a case that posed a threat to a strategy the Justice Department uses in housing-discrimination cases. The essence of the strategy is that plaintiffs alleging a policy is discriminatory don't have to show an intent to discriminate, but just that the policy has a "disparate impact" on minorities. The wisdom is in a book, "Lee Kuan Yew: The Grand Master's Insights on China, the United States and the World," a gathering of Mr. Lee's interviews, speeches and writings. Mr. Lee, of course, is the founder and inventor of modern Singapore. He made it a dynamo. He pushed it beyond its ethnic divisions and placed a bet that, though it is the smallest nation in Southeast Asia and has few natural resources, its people, if organized and unleashed within a system of economic incentive, would come to constitute the only resource that mattered. He was right. When he took office as prime minister, in 1959, per capita income was about $400 a year. Last year it was more than $50,000. What worries him about America? Our elections have become "a never-ending process of auctions" in which politicians outbid each other with promises. America's leaders seem captive to popular sentiment. They must break out of this and do what is necessary for America, "even if they lose their re-election." What can destroy America is "multiculturalism," which he speaks of as not an appreciation of all cultures but a gradual surrendering of the essential culture that has sustained America since its beginning. That culture—its creativity and hardiness, its political and economic traditions—is great, and it would be "sad for America to be changed even partially." Will waves of immigrants from the south assimilate, or will America become "more Latin American?" America must continue to invite in all the most gifted and hard-working people in the world, but it must not lose its culture, which is the secret of its success. And America goes the way of modern Europe at its peril: "If you follow the ideological direction of Europe, you are done for." There are always people who require help, but "addressing their needs must be done in a way that does not kill incentive." "Americans and European governments believed that they could always afford to support the poor and the needy: widows, orphans, the old and homeless, disadvantaged minorities, unwed mothers. Their sociologists expounded the theory that hardship and failure were due . . . to flaws in the economic system. So charity became 'entitlement,' and the stigma of living on charity disappeared." Welfare costs grew faster than the government's willingness to raise taxes. They "took the easy way out by borrowing to give higher benefits to the current generation of voters." The result: deficits and dangerously high public debt. Republicans embrace Obama’s offer to trim Social Security benefits - Medicare, Medicaid and Social Security account for nearly 40 percent of federal spending and are growing rapidly. At the same time, House Speaker John A. Boehner (R-Ohio) said he has moved to tamp down criticism of Obama’s proposal . . .
Chained CPI has come up in private negotiations and recommendations from independent groups, such as the Bowles-Simpson commission. But Obama’s decision to include it in his formal budget request — and House leaders’ decision to hold hearings with the hope of drafting bipartisan legislation — is plowing new ground. SGTC lowers the flag to half-mast as it mourns Boston and all involved. Obama’s Budget Revives Benefits as Divisive Issue - Oh my goodness: Some on the left have already begun talking about encouraging a liberal Democrat — the freshman Senator Elizabeth Warren of Massachusetts is the name most bandied — to take up the “don’t touch Social Security or Medicare” banner as part of a liberal bid for the party’s nomination to succeed Mr. Obama, even against Clinton or Biden. Whether or not Republicans ever agree to a budget deal with President Obama, one thing seems certain: now that he has officially put Social Security and Medicare benefits on the negotiating table, opponents on his party’s left will make that an issue for Democrats in the midterm elections next year — and perhaps in the 2016 presidential contest. In the midterm races already taking shape, Democrats who back Mr. Obama’s budget proposals to trim future benefits as part of a long-term deficit-reduction compromise could be attacked from the left and the right. Liberal groups and some union activists are threatening to recruit candidates to challenge these Democrats in their primaries. Even if Democratic incumbents do not draw a primary challenger, liberal activists say, they might face a shortage of volunteers motivated enough to do the hard work of campaigning — just as Democrats did in the 2010 midterms, which resulted in big Republican gains. Looking further ahead, to 2016, some on the left have already begun talking about encouraging a liberal Democrat — the freshman Senator Elizabeth Warren of Massachusetts is the name most bandied — to take up the “don’t touch Social Security or Medicare” banner as part of a liberal bid for the party’s nomination to succeed Mr. Obama, even against Hillary Rodham Clinton or Vice President Joseph R. Biden Jr. Hate it: Palestinian Prime Minister Resigns, Adding Uncertainty to Government - Mr. Fayyad, an American-educated economist, had gained the confidence of the West and of many Israelis, building up the credibility of the Palestinian Authority by introducing transparency, accountability and stability. The internationally respected prime minister of the Palestinian Authority, Salam Fayyad, resigned on Saturday, raising concerns about political stability in the West Bank days after Secretary of State John Kerry proposed a broad initiative to aid the Palestinian economy there to shore up peace efforts. The president of the Western-backed authority, Mahmoud Abbas, accepted Mr. Fayyad’s resignation but asked him to stay until a new government could be formed, according to Palestinian officials, signaling an effort to minimize the upheaval. But the timing of the resignation, which had been brewing for weeks over Mr. Fayyad’s differences with Mr. Abbas and his Fatah party, seemed to deliver a blow to American prestige at the very least. The possibility of heading off the prime minister’s resignation was among the topics that President Obama discussed with both Mr. Fayyad and Mr. Abbas when he visited Ramallah, West Bank, last month, and it was also a focus of Mr. Kerry’s meeting with Mr. Abbas last week. Since Mr. Kerry left the region, he has had more than one telephone conversation with both men to try to prevent the resignation. Israeli officials have also been quietly urging Mr. Fayyad to stay, aware that their public support is likely to backfire. 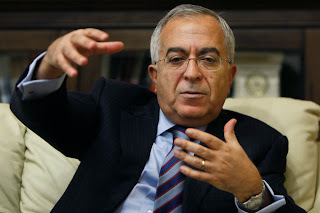 Underlying tensions between Mr. Fayyad and Mr. Abbas burst out in early March when the finance minister, Nabil Qassis, announced that he was quitting. Mr. Fayyad accepted the minister’s resignation against the wishes of Mr. Abbas. Mr. Fayyad, an American-educated economist, had gained the confidence of the West and of many Israelis, building up the credibility of the Palestinian Authority by introducing transparency, accountability and stability. Since being appointed to the premiership in 2007, he has championed law and order in the West Bank after years of chaos and focused on building the institutions of a future state. But he has struggled to build a popular constituency on his home turf and became a target for senior Fatah figures resentful of his power, and who blamed him for all the authority’s problems. People who spoke with Mr. Fayyad on Saturday and throughout the past week said he had grown increasingly frustrated over attacks on his leadership by Fatah officials, and over Mr. Abbas’s failure to either defend him publicly or move behind the scenes to quell the criticism. Mr. Abbas appointed Mr. Fayyad prime minister of the government formed after the split with Hamas. The Islamic group, Hamas, won Palestinian parliamentary elections in 2006 and a year later seized control of Gaza after a factional war there. Hamas routed Fatah from Gaza, confining Mr. Abbas and his authority to parts of the West Bank. Obama understands that entitlement programs represent a fundamental threat to the sustainability of the welfare state. He understands that politics can only work if the president transcends his base and builds a majority coalition. We’re living in a country where 53 percent of children born to women under 30 are born out of wedlock, according to government data. Millions of people, especially men, are dropping out of the labor force. Nearly half the students who begin college are unable to graduate within six years. The social fabric for people without college degrees is in shambles. I generally come to celebrate, not criticize, this budget. Obama has the guts to take on special interests in his own party. He works hard to reduce inequality. He understands that entitlement programs represent a fundamental threat to the sustainability of the welfare state. He understands that politics can only work if the president transcends his base and builds a majority coalition. His budget should put to rest those crazy claims that he is some sort of Norwegian socialist. Republicans would get structural entitlement reform. Here, too, we could build on the ideas in the Obama budget, like chained Consumer Price Index for Social Security and the expansion of means-testing for Medicare. Then we could throw on other modest structural reforms: Combine Medicare Parts A and B and further limiting Medigap plans in order to induce seniors to make more cost-conscious decisions. Repair federal pensions and the disability system. Means test Social Security and raise the Medicare eligibility age for affluent workers. President Obama's Savannah port money disappoints - Georgia officials had hoped for roughly $100 million as Savannah and other East Coast ports race to deepen their harbors to handle the supersized cargo ships expected to begin arriving through an expanded Panama Canal in 2015. President Barack Obama is recommending $1.28 million in federal funding in the next fiscal year for the proposed deepening of the Savannah harbor — far short of what Georgia officials were hoping for as they get ready to begin construction. The proposed installment for the $652 million project for the Port of Savannah was contained in the White House’s budget blueprint released Wednesday. Georgia officials had hoped for roughly $100 million as Savannah and other East Coast ports race to deepen their harbors to handle the supersized cargo ships expected to begin arriving through an expanded Panama Canal in 2015. The state has already allocated $231 million for the Savannah project, which could be the saving grace for a construction start later this year. “But make no mistake — we are extremely disappointed,” said Curtis Foltz, executive director of the Georgia Ports Authority. “The administration had a great opportunity to stand tall and support the pledge it made last summer to expedite this project,” he said. “Instead, the budget request was doubly disappointing as it didn’t address the need to raise the spending limit on the original project — set some 15 years ago — and it didn’t provide any significant funding. “When they failed to recommend an increase in the spending limit, they couldn’t provide the funding,” Foltz said. The Port of Savannah is the second-largest for exports in the country. It’s imperative to address the spending limits issue, as that could stall construction already financed by the state, Foltz said. “Congress can do that through the water bill and other avenues, and our delegation is working hard on that as we speak. If we can get past that hurdle, there’s still a good chance we can start significant construction this year,” he said. Last July, the president listed seven “nationally and regionally significant infrastructure projects” at five major ports — including Savannah’s — promising to put each on a fast track designed to save time and drive better outcomes for local communities. Of the five, Savannah’s deepening project was the furthest along. “The proposed project would enable the Port of Savannah to accommodate larger cargo vessels and other ships, ultimately facilitating more efficient movement of goods,” the White House said in announcing its “We Can’t Wait” initiative. Congressman Jack Kingston, R-Ga., was clearly frustrated Wednesday when he learned what the budget suggested. “Last July, the Obama Administration touted its commitment to expediting the deepening of Savannah’s harbor,” Kingston said. “Today it failed to honor that commitment by continuing to slow walk this project. “What happened to ‘We can’t wait’? “The Savannah Harbor Expansion Project will create jobs and prepare our region and our nation for the economy of the future,” he added. “Today our ports contribute $4.5 billion in federal taxes annually. They account for more than 352,000 jobs and contribute $32.4 billion to Georgia’s economy alone. Continued delay threatens to shut off this economic engine. U.S. Sen. Johnny Isakson took a more conciliatory tone. “I am pleased that the administration continues to have a placeholder in the budget for the Port of Savannah and has maintained the commitment to keep it there,” Isakson said. In Latest War Between the States, Georgia Says Tennessee Is All Wet - Wayward Surveyors Blocked River Access; Is Jack Daniel's Whiskey Next on the List? 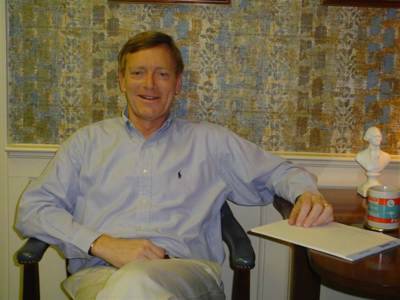 Brad Carver, a Georgia lobbyist, is thirsting for a small patch of land just north of the line now dividing Georgia from Tennessee. Two centuries ago, surveyors from Georgia and Tennessee marched through the region's mountains and hollows to mark the official border between the two states. They were supposed to follow the 35th parallel, according to an agreement approved in 1802 by Congress. Instead, they wandered about a mile south, marking a border that puts the Georgia state line here, just a minute's stroll from the edge of the broad Tennessee River. That has led to years of water wars between Georgia and Tennessee, as the Peach state's population has exploded, outstripping its water supply—all while the Tennessee River has flowed achingly close. Now Mr. Carver has floated a resolution in the Georgia state legislature that calls on Tennessee to give Georgia about 1.5 square miles of forest and meadow north of a small country road here called Huckabee Lane—just enough to get a pipe into a wide inlet at a dammed-up part of the river called Nickajack Lake. He says that could easily supply parched Georgians with more than a billion gallons of water a day. On a recent visit, Mr. Carver, in a gray suit and sunglasses, carefully walked across the soggy, disputed land and stopped at the water's edge. "We call this occupied Georgia," he said, pointing to the wet earth. He is proposing what he calls a generous swap. Georgia would give up its long-standing claim to be the rightful owner of about 68 square miles of land and water given to Tennessee when the surveyors mistakenly ambled off the parallel. It includes large parts of the river, several towns and the homes of 30,871 residents, Mr. Carver says. To make his point, he has handed out white papers on the bungled border, pressed the issue with numerous Georgia politicians and appeared on a History Channel program called "How the States Got Their Shapes," where he hit a golf ball from Huckabee Lane into the Tennessee River to show viewers how close it is. If the Volunteer state doesn't accept the offer, Georgia will take its case to the U.S. Supreme Court, the arbiter of all state border disputes, says Mr. Carver. Tennessee says Georgia's proposal is all wet. "The governor will continue to protect the interests and resources of Tennessee," a spokesman for Republican Tennessee Gov. Bill Haslam said in an email. Mr. Carver's resolution—the 10th from Georgia since 1887 calling for a change in the border—passed overwhelmingly in both legislative chambers. His proposal is less bellicose and more modest—yet more desperate—than past claims to the mismarked land. Over the years, resolutions from agitated Georgia legislators have called for the return of all 68 square miles. 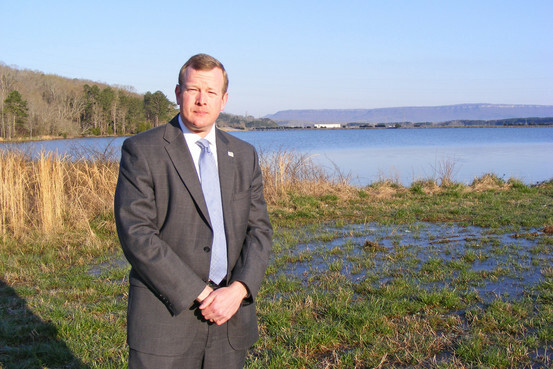 A resolution in 2008 prompted Ron Littlefield, the mayor of Chattanooga, Tenn., to send a truck of bottled water to the Georgia State Capitol in Atlanta along with a proclamation calling Georgia lawmakers "misguided souls" engaged in "irrational and outrageous actions seeking to move a long established and peaceful boundary." "It is feared that if today they come for our river, tomorrow they might come for our Jack Daniel's or George Dickel," the proclamation read, referring to Tennessee whiskey. Georgia legislators see little humor in the situation. When the Georgia senate passed the resolution 48 to 2 on March 25, state Sen. Charlie Bethel, a Republican from north Georgia, sternly condemned Tennessee politicians' "late jocularity on the issue." The resolution directs the state to sue if Tennessee doesn't cooperate. A spokeswoman for Georgia Gov. Nathan Deal declined to comment on whether he supports the resolution. Georgia is thirsty despite a rainy winter that has filled reservoirs. Its population has nearly doubled over the past 40 years, and frequent droughts have restricted development and forced residents of Atlanta at times to use dirty water to irrigate their gardens. Experts on the history of American surveying say many state borders in the Eastern U.S. have quirky twists and turns. Tennessee's borders with Virginia and Kentucky are also off the mark of what was originally approved. Tennessee's claim that it should continue to control the land stems from "acquiescence," a concept in property law that it has the right to keep a boundary if it is not contested over a long period. Mr. Carver and other Georgians insist their state has complained about the border to Tennessee numerous times and therefore never "acquiesced." It remains to be seen whether Georgia's threat to take the case to the Supreme Court holds water. Any state in a border dispute with another can petition directly to the high court under judicial powers defined in Article III of the Constitution, according to Joseph Zimmerman, a political-science professor at the University at Albany, State University of New York, and the author of several books on interstate disputes. Mr. Zimmerman said the court almost always takes such cases, and then appoints a special master, usually a retired judge, to review the facts of the case and sometimes make a recommendation to the court. "This could very well happen, if Georgia wants to push it," he said. Even if Georgia ever got the boundary moved, it still wouldn't necessarily be able to slake its thirst. The Tennessee Valley Authority, which owns the property in question and manages the river here, would have final say on whether Georgia could pipe out water, according to a spokeswoman. Buster McCulley's parents are buried in an old cemetery on the land Mr. Carver is proposing to annex from Tennessee. The 82-year-old preacher from Alabama said he didn't think his departed ancestors would mind suddenly becoming Georgians. "I don't think they'd be much disturbed," he said. "Probably when they started the cemetery they didn't give much thought to what state it was in anyway."